We sell our beautiful Gift Certificates in-store for any dollar amount. Not in town? You can also purchase one in one of our most popular dollar amounts in our online store. Please click on the Shop button in the Menu. REDEMPTION: In all cases, a Gift Certificate must be presented for use as payment of goods and services. EXPIRATION: Gift Certificates expire one year from date of purchase. After expiration date, certificate may still be used for retail purchase. FORGOTTEN CERTIFICATES: In the event you have forgotten to bring your gift certificate to Pure Spa…….You must pay for your day’s services and purchases with cash, check, or credit card. You can then redeem the certificate at a later date. 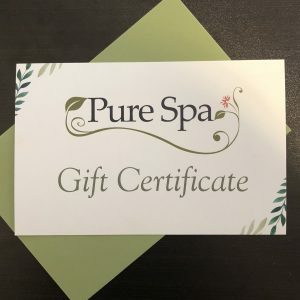 LOST CERTIFICATES: In the event you have lost a Pure Spa Gift Certificate………We are sorry but Pure Spa is not responsible for lost gift certificates. PROMOTIONAL GIFT CERTIFICATES: In the event you receive a promotional gift certificate………The gift certificate must be redeemed in full by the expiration date……..The certificate cannot be used for Gratuities, Discounted Services or Retail….The certificate cannot be used in conjunction with any other offer. *We are trained professionals and reserve the right to refuse service to any client who is acting in an inappropriate manner or who is not forthcoming about medical conditions that may cause a contraindication to treatments.